Animal Wildlife | Ladybird | The ladybird (also known as the ladybug) is a small colourful beetle found all around the world. There are thought to be more than 5,000 different species of ladybird in the world, with more than 450 species found in North America alone. 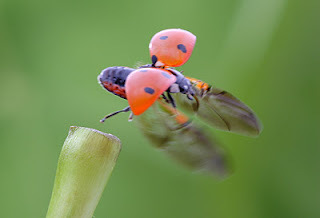 The ladybird is best known for it's spotted body (normally red and black, but often orange and yellow are found), and their ability to rid gardens of their aphid pests affectively. It is thought to be good luck to find that a ladybird has landed on you, and most definitely bad luck if you then squash it! 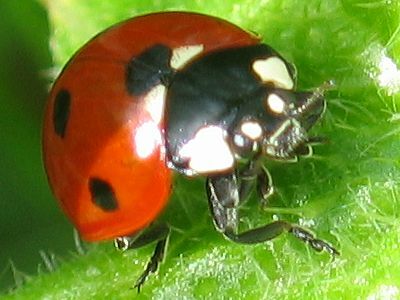 Ladybirds are small sized insects rarely growing to more than a centimetre in length. Ladybirds have size legs that are black in colour and their brightly coloured shell, protects the wings of the ladybird which are concealed beneath the spots. Ladybirds are known to hibernate once the warm summer weather begins to cool. Ladybirds will hibernate in large groups in sites which are used year after year, and ladybirds are thought to hibernate in this communial fashion in order to increase their chances of surviving the cold winter. It is thought that pheromones are released by hibernating ladybirds which attract other ladybirds to hibernate in the same place. Ladybirds are fearsome predators within their environment and are known as gardener's friends as they munch all of the tiny pests that eat the plants. Ladybirds primarily eat aphids, greenfly, plant-lice and other small insects. 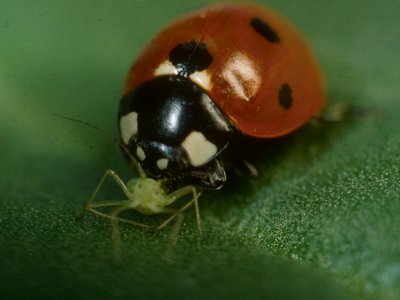 It is thought that the average ladybird eats more than 5,000 aphids in just one year. 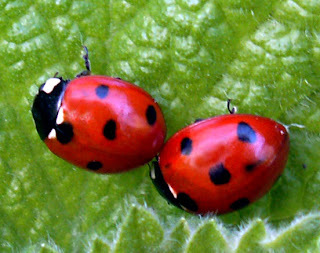 Ladybirds are prey to a number of animals in their environment that include birds, reptiles, amphibians, small mammals, rodents and other insects. 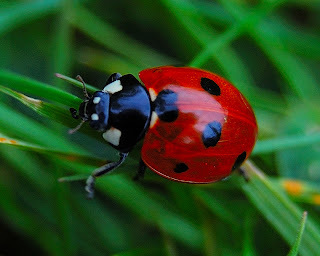 It is thought that the bright colour of the ladybird is used to deter hungry predators as they think that the ladybird will taste disgusting or is poisonous. The female ladybird can lay more than 2,000 eggs in one year that hatch in just a few days. The ladybird larvae hatches out of the eggs and looks nothing like an adult ladybird as the ladybird larvae is long in shape and is generally one colour. After a couple of weeks, the ladybird larvae evolves into a ladybird pupa which is about the same size and colour as an adult ladybird but has a protective layer surrounding it, until it has developed it's wings. Once the ladybird pupa has developed, it breaks out of the skin surrounding it to become an adult ladybird. Due to climate changes and habitat loss, the ladybird is now considered to be one of the animal species that is threatened with extinction. It has been noted that ladybirds are particularly sensitive to temperature and will die from dehydration if it is much hotter than it should be.